Maybe it was you who said them. Or a spouse, child or co-worker. Living in pain. Financial challenges. Emotional upheavals. Relationship struggles. Other things are really … not that hard. It’s just perspective. My regular readers know I’ve been exercising and eating healthier most of the time. I’m feeling the results. Clothes are looser, my face is leaner, and my rings spin. I sleep great. I feel w-e-l-l. Unlike prior attempts, this is no longer a temporary fix, this must be a lifelong choice for me. Where the challenges come are when we’re out with friends. Last night at bowling, for example, someone thoughtfully ordered snacks for the table. Everything was fried and everything was delicious. But this morning, I can feel the grease and salt. Today’s a new day. And I’m making the hard choices, again. Have you taken a more active role in your health? What obstacles do you face in meeting your goals? I am one of those very weird people who actually likes healthy food. Mostly I don’t like appetizers because they are deep fried or full of fat. I don’t feel good after eating them so I pass them up easily. That’s not to say I am perfect. Potato chips are my down fall and I would rather pig out on that then deep fried mozzarella sticks. You are right though. It’s a life choice that’s forever (except for my occasional chip noshing). Oh yeah…forgot about the ice cream…..
Good for you!! Keep after it! Thanks for the support – it’s hard to change old habits – but it’s do-able. A great quote I read recently was this one, “You can exercise an hour a day. It’s the other 23 hours of food choices that are the kicker!” So true! Oh dear, you ask this on a weekend? Guilty of potato chips, onion dip to go with them, snickers bites and french fries on Saturday. But today it was baby carrots and broccoli to go with the onion dip before a lunch of broiled fish, green salad and fruit salad. I’m pretty good 6/7 days, but Saturday I do kick back and enjoy. Have a great weekend, MJ. I’m with you, MJ: I can pass by the ice cream, but not those chips! Had a feeling you would, David! Yes. Last spring I was diagnosed with type 2 diabetes and I completely changed my diet. I also did energy healing around that issue. All the (energy) work I’d done around having an eating addiction really paid off, because when I changed my diet (permanently), it was relatively easy. It made all the difference in the world for me. Since then I have lost over 70 lbs and had to have my wedding ring resized down. (And I no longer have diabetes). But I’m still working on adding the exercise piece. Kudos to you in your changes! 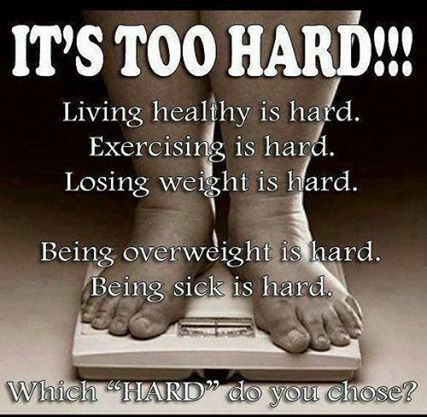 I love the phrase “being overweight is hard”. Never thought of it that way, but that is so true. Much harder to deal with being overweight and all the awful health issues it brings, than living healthy. Good luck on your journey to feeling w-e-l-l. Am on the same path! That resonated with me as well – bam! there it is! I love your perspective, MJ. So much of life is hard, and I find the eating/exercise part particularly so. I used to be disciplined about these kinds of things, but I’ve lapsed. And, yes, eating out with friends is the worse! It’s a slippery slope – and I’m someone who is either all in or nearly all out. And I hope what you ordered was delicious! We just do the best we can most of the time – I’m still going to have some pie at Thanksgiving but there’s a lot of other stuff I can happily skip. The ‘aha’ for me was how miserable I felt after one night of naughty foods = wake up call!! Oh, I KNOW! I ate more sugar this week than I typically do – and I felt it. I had a dull headache the day after a sugar binge. I’ve slowly come around to healthy habits in my life. It’s been hard. We grew up in a generation that didn’t really know how to be healthy, didn’t really know how bad some things were for the body. And the attitude seemed to be that it wasn’t necessary to exercise if you didn’t need to lose weight. (Exercise was NOT important in my family.) I had to come to certain realizations on my own. Exercise and eating well is important not just for weight loss, but for general health and well-being. My biggest obstacle is me! When my exercise routine gets interrupted, I have a hard time getting back on track.